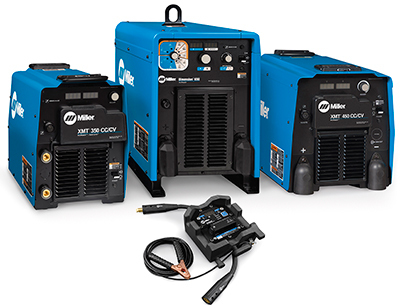 Miller Electric will showcase its latest welding and safety equipment, including new power sources and welding-automation solutions. It also will host live welding demonstrations, providing visitors with hand-on experience with the equipment. These demonstrations will be paired with solutions from Miller-recommended partners—Hobart filler metals, Bernard semi-automatic welding guns and Tregaskiss robotic guns. Among the many new-product innovations on display will be the ArcReach Stick/TIG Remote (shown), designed for use with Miller’s compatible XMT 350 CC/CV, XMT 450 CC/CV and Dimension 650. The remote allows welding operators to change weld settings at the weld joint, which reduces downtime and improves safety—no more unnecessary trips to the power source. The remote also eliminates the need to settle for less-than-optimal welding parameters to improve weld quality, and it allows for more arc-on time to increase productivity.